Product prices and availability are accurate as of 2019-04-24 16:39:45 CDT and are subject to change. Any price and availability information displayed on http://www.amazon.com/ at the time of purchase will apply to the purchase of this product. BBQ like a pro! Create succulent, juicy and finger-licking good barbecue with this 32" long shaped charcoal grill. 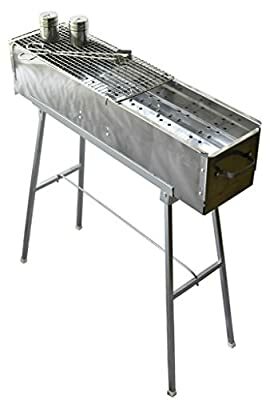 This grill is specially designed so that skewers can sit on both sides of the grill, allowing meat in the middle to be cooked right in the center of the heat. Gone are the days that the meats are only half cooked when the wooden sticks are starting to burn! Grilling skewers on a traditional gas grill is a tough task. Traditional grill's heat is concentrated in the center of the grill. On one hand, placing skewers on the edge of the grill will only have the top portion of the skewer contact the heat. On the other hand, placing skewers in the center of the grill will risk having the wooden stick burned all together. 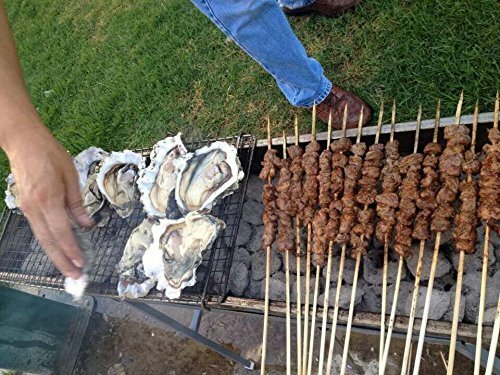 It is hard to find a perfect way to cook skewers on a traditional grill. An 8 inches width grill solves the problem. Since this grill is 8 inches wide, only a small portion of the wooden skewer is exposed to the heat. Not only it'll cook the meat perfectly in between, the skewers will be free from the heat source and can be turned with ease. Contact-less grilling on skewers means food will not get stuck on the grate, further reducing the risk of teared skin such as those on chicken wings. This will produce moist and juicy barbecue every time when done correctly. RUST-PROOF AND WARP-PROOF, EASY TO CLEAN - Made of Heavy Duty Stainless Steel Inside and Out. Size of Grill (L x W x H) : 32" x 8" x 7" / Grill with Stand (included) 32" x 8" x 34". Rounded edges prevent finger cuts. Item comes pre assembled, very minimal assembling is required. VENT CONTROL ON BOTH SIDES - This BBQ Grill features easy to adjust vent that controls heat intensity and create even air circulation throughout the grill. 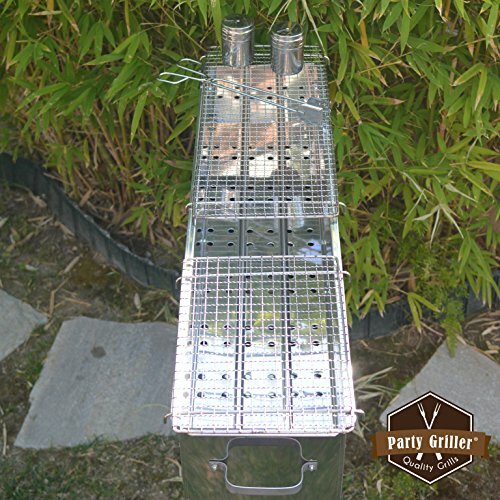 Eliminate hot spots with this easy to use charcoal grill! RESTAURANT QUALITY DESIGN - Long rectangular grill makes grilling Yakitori, Satay and Kebab a breeze. Traditionally these Skewer Grills are made of iron. Stainless Steel design makes it light and portable, yet maintain its functionality. Bring this Portable Grill to the park or use it as Camp Grill! BARBECUE GRILLS AT ITS BEST - Also called a Portable Mangal Grill, this stainless steel grill is perfect for any Skewers, Shish Kebab, Lamb Kebab, Shashlik, Japanese Yakitori, Malaysian Satay, Thai Satay and Chinese Lamb Skewer (???) EXTRA BONUS - Set of 2 Stainless Steel Seasoning Shakers, perfect for your custom BBQ seasoning spice blend. Plus a High Quality 12 inch Scissor BBQ Tongs. That's $10 in value! This grill comes with a 20"x 8" and a 12" x 8" Stainless Steel Mesh Grill Grate, covering the entire grilling surface. Genuine PartyFairyBox & PartyGriller items will be shipped from California.